Early January 2016 an interesting encounter took place here on Sweephand’s Blog. Thanks to Stephen’s efforts Kelvin from New Zealand and Bert from The Netherlands met. Subject of their conversation was Kelvin’s vintage Citizen diving watch. It soon turned out that this was no ordinary guy and no ordinary watch either! Kelvin and his watch served in the Vietnam War. From 1965 until 1973 New Zealand was involved in the Vietnam conflict to meet allied expectations. The Prime Minister decided to keep the involvement at a minimal level because New Zealand’s military resources were already stretched in Malaya at that time. Nevertheless, a total of 3890 New Zealanders served in Vietnam. Among them were Medics, Engineers, SAS, Airforce, Navy, Infantry and Artillery troops. “I joined the New Zealand Army at the age of 19. I had just finished an automotive apprenticeship that made me a qualified mechanic. I went to Vietnam at the age of 20 in October 1968. Nobody had to go! We were all volunteers and I served in the 161 Battery of the RNZA. I was a young guy and wanted to taste some adventure! I can remember celebrating my 21st birthday out in the jungle. I treated myself with some extra chocolate that day”. “I was a Battery Surveyor for TARA: Technical Assistant Royal Artillery in the Royal New Zealand Artillery. I was one of the guys who worked out where we were, which way to point the guns (105mm howitzers), range to target, powder charge needed et cetera. Later I was put out with an Aussie Company as a member of the Forward Observation Team. Map reading skills were really needed back then as we had no such thing as a GPS. Just a map, a compass and me”. “161 Battery was stationed in Nui Dat in the Vung Tau District in southern Vietnam. There was a PX (Post Exchange) in Vung Tau, run by the U.S. Army. It was the only possible way for troops to buy decent products like cameras, RayBans, electronics and watches but also simple things like Zippo lighters, magazines or fastfood. I visited the PX while we were on leave. I wanted to buy a good and sturdy waterproof watch because of the humid Vietnamese climate. When I saw the Citizen I knew that would be the one”. “From that moment on it was my everyday wear watch. We have been through jungles, monsoon rains and swamps together. I remember one time we were all up to our chins in deep water just going forward on our tip-toes. How far? Maybe 700m to 800m before we found shallower water. I was standing there with just my head showing and there were little brightly colored tropical fish swimming around my chin. We made many helicopter rides together and trips in the Armoured Personnel Carrier (APC). The Citizen just shrugged it all off and never faltered”. “Yes Bert, the watch has been worn in combat. It was the Artilleries job to support Infantry and other troops at the various frontlines. We used the Howitzer to fire at enemy lines and clear the path for our guys. I have been shot at by various types of small arms, Rocket Propelled Grenades (RPG’s), and was even mortared once”. “Sure we did. When we were on R&R (Rest and Recreation) we had great times together. You can imagine a bunch of young guys being together in hazardous situations for a long time. We were brothers, we were family. I can remember one time that we went out and I had too many beers. I had to sleep it off. This took me so long that the Citizen actually stopped running. I was so still the autowind wasn’t getting activated. It took 3 days though to do it! “Yes, after one year, in October of 1969 I returned back to New Zealand. I had the watch checked by a watchmaker to make sure that no moisture or debris had sneaked in. It was not the case, the watch was still perfect. I wore it a time or two out on a date but that was all. 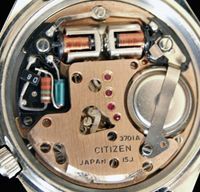 At the end of 1969 the watch ended up in a box in a drawer together with the gold-plated “Kiwi” pin that we were given to wear on our dress uniform on the way back from Vietnam to New Zealand”. “At the end of 2015, 47 years after I purchased the watch, I opened the drawer and noticed the box. I got my watch out and gave it a wee swirl around to activate the autowind. Just like that it started up, unbelievable. I held it for a while and it then took me back to a time when I was a young man. I can still see the images of the Battery in action, I remember some old mates who have now gone. We are getting older and fewer all the time. This was a truly emotional moment for me. I wore the watch for a couple of days to see how it would hold. The Citizen kept time perfectly and I must say it still looked great on me! This truly is a fantastic watch”. “You made me a very happy man Kelvin. Thank you so much. I will treasure your watch and wear it with pride”. 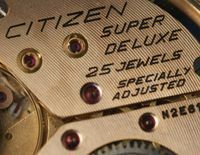 In 1968 Citizen introduced the 62-5370 150M diving watch. You will find more information about it right here on the Blog. This watch was intended for the Japanese domestic market. 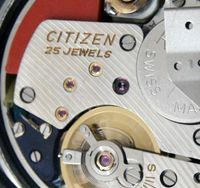 Citizen released the B52806 at the same moment as the export model for the 62-5370, intended for users in the rest of the world. A front view of these two watches reveals some slight differences. The size of the handsets differs and the B52806 is fitted with a luminous ball at the end of the seconds hand for better visibility under water. It has the 21j 5430 caliber on board, beating at 18.000 bph. There is no dial code, just JAPAN MADE near 6 o’clock. The back of the watch carries a beautiful engraving of a SCUBA diver in action. 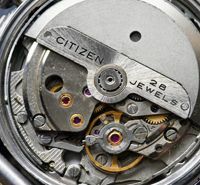 There is no serial number on this watch which makes it impossible to date it as exactly as we are accustomed to with other vintage Citizens. However, we do know that it was produced in limited numbers in 1968, 1969 and 1970. Kelvin purchased his watch in 1968 so it is one of the oldest known today. 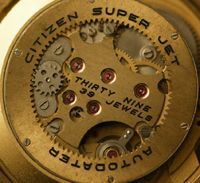 In 1971 production seized when Citizen introduced the 68-5372. Finding a B52806 is close to impossible. Finding this one in this shape and the complete history to it is a miracle. Thank you Kelvin for making this miracle possible. We salute you Sir! B52806 posing with the Dress Uniform gold plated Kiwi pin and a safe conduct pass. These passes were dropped in huge numbers by the US and South Vietnamese air force over enemy territory to convince VC and North Vietnamese troops that they would get a fair and good treatment after surrender. Back view of the diver engraving. B52806 at the start of its second life in The Netherlands. In beautiful condition with it’s original grain of rice bracelet and keeping perfect time. Thanks again to Kelvin for making this dream and this post on Sweephand’s Blog possible.